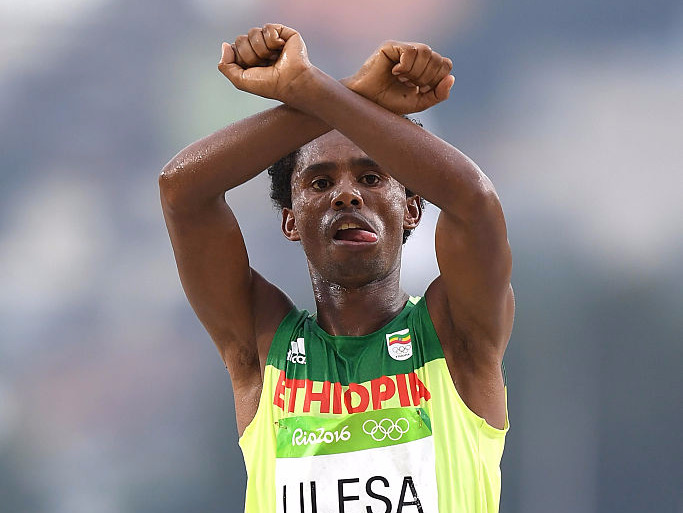 Matthias Hangst/Getty ImagesFeyisa Lilesa of Ethiopia crosses his arms in an anti-government protest as he finishes to win silver during the Men’s Marathon during the 2016 Olympic Games. A wealth of psychological research has found the people who achieve most in life take the same deliberate steps to make sure they reach their goals. Sometimes it means minimising the value of will power; other times it means dusting yourself off after defeat. Here are some of the psychological strategies the most successful people adopt in their daily lives. Growth mindsets give people the ability to see themselves as capable of change -- notably, growth -- while fixed mindsets cause people to view themselves as fully realised, or unchanging. Having a growth mindset leads to far higher achievement than having a fixed one, Dweck's research has found. Psychologist Angela Duckworth has found time and again that the ability to recover after failure is one of the most common traits of successful people. Duckworth calls this resilience 'grit,' and it's often the grittiest kids who get into the best schools, get the best jobs, and, incidentally, win the most spelling bees. Some experts have even said grit is the single-most important trait to become successful. Emma Seppala, science director of Stanford's Center for Compassion and Altruism Research and Education, wrote in her recent book 'The Happiness Track' that successful people don't agonize over their shortcomings. Self-compassion is a sign you recognise that you, too, are human. You make mistakes like everyone else. What matters in terms of your success is what you do next. They turn goals into systems. Harvard psychologist Amy Cuddy says too many people focus on the moonshot goal instead of the steps needed to get there. Successful people focus on the process and often manage to enjoy it, Cuddy says, rather than zeroing in solely on the desired outcome. You might set the goal of running a marathon, for example, but research suggests it will only be through a steady running routine that you'll end up being successful. They don't rely on willpower alone. In his recent book 'Irresistible,' NYU psychologist Adam Alter discusses the misconception that successful people tune out distractions just by ignoring them. Everyone's phones are vibrating for their attention. But people can power through those disruptions by eliminating the temptation to check altogether, Alter says. That can mean installing site blockers or physically putting a device far away, out of both sight and mind.